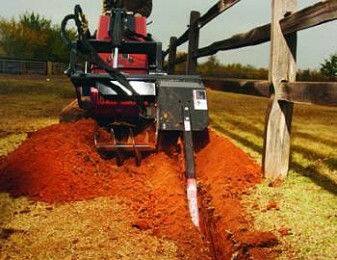 Used to cut trenches in a variety of ground conditions with a large selection of digging chains and booms available. 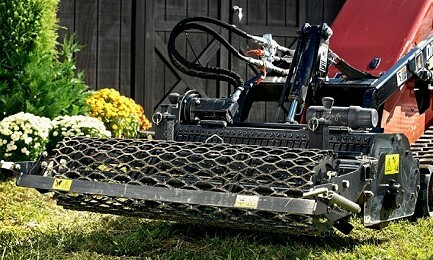 Used for pulling-in or feeding cables and pipe underground with minimal turf disruption. 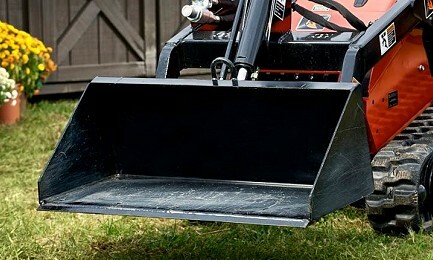 Used for cutting soil, asphalt, concrete or rock. 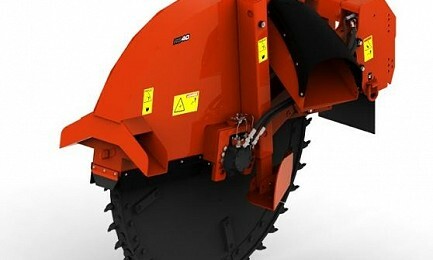 Saw can cut centreline or offset 254mm toward the right side of the unit. 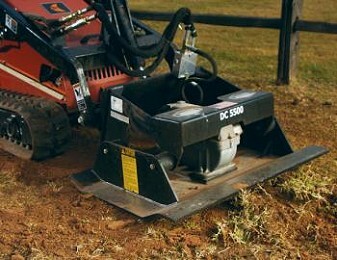 Used for boring under pavements, driveways and other obstacles. 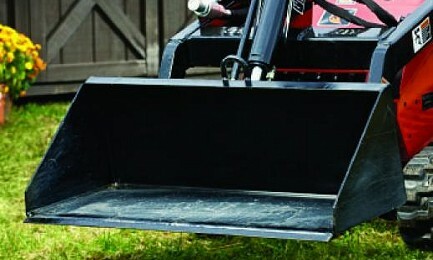 Used to Backfill Trenches, or to move earth/snow and basic grading and scraping. Tilts 15 Degrees each direction and swings 30 degrees left and right. 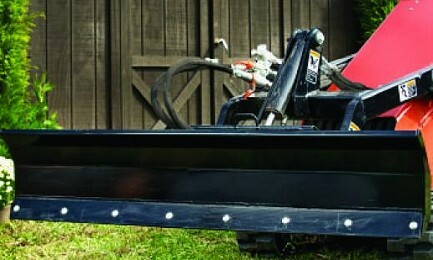 STANDARD BACKFILL BLADE ATTACHMENT (48" and 67"
Used to Backfill Trenches, or to move earth/snow and basic grading and scraping. 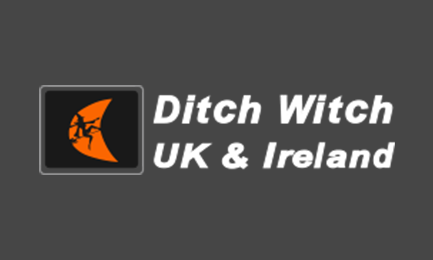 Used in conjunction with a Ditch Witch Vibratory Plough, for installing fencing to contain Soil/Sediment Erosion and for Newt Fencing. 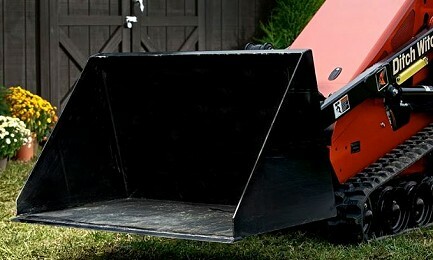 Used for scooping, lifting and transporting materials. Used for scooping, lifting and transporting light materials. Used for loading and unloading, hard to handle materials. Used to sort rock and debris, while leaving soil in place. 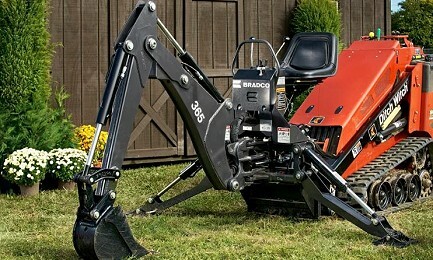 The 75mm spacing of the times allows dirt, sand and gravel to fall away, while the larger rocks stay in the bucket. Used for lifting, lowering and transporting pallets. Digs up to 2 metres depth with 5 optional bucket sizes up to 457mm. 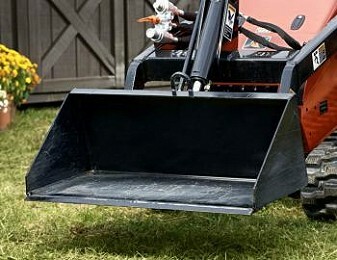 Used for levelling, loose terrain and carrying cargo. 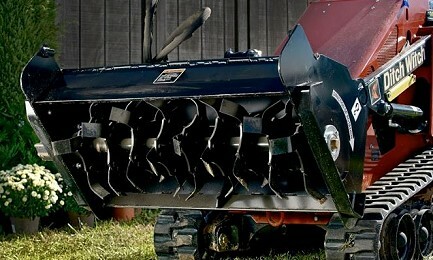 Used for landscaping and preparing seedbeds. 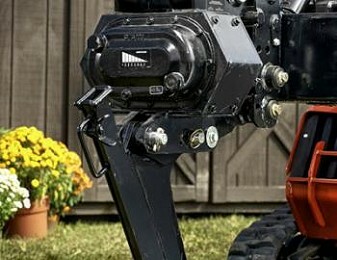 Available in rigid, manual or hydraulic frame swing configurations. Used to bury rocks, clods, turf and debris, preparing seedbedsand landscapes for seed and sod. 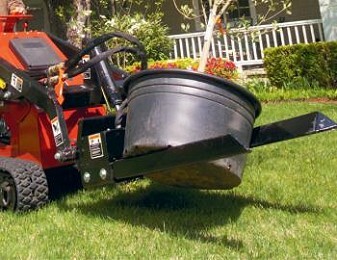 Used to carry and un-roll, rolls of sod up to 1.11m in size, optional weighted drum available for smoothing. 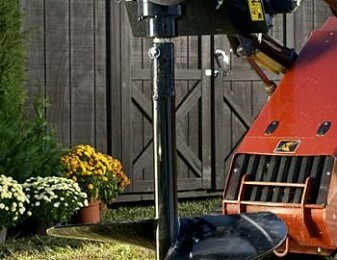 Used to install fence posts and signs in various soils. 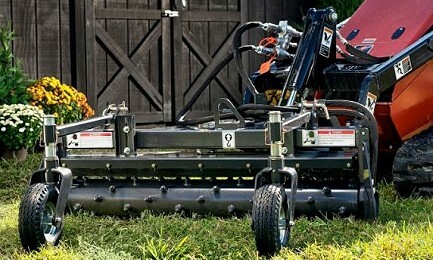 The Flail Mower is a Heavy-Duty attachment, that will cut wood stems, mulch and clear all kinds of scrub/brush and will mow thick and long grass. 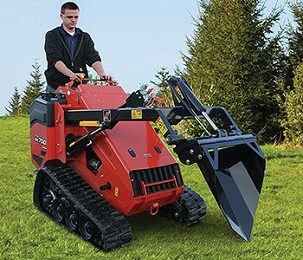 Its ideal for land clearance, for mowing motorway/road verges, rough ground, ditches and hedges. 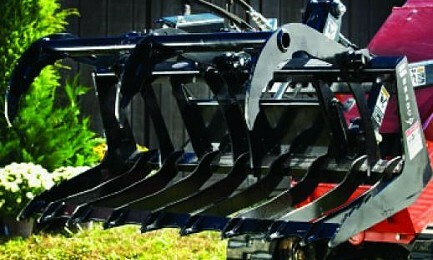 Used for clearing lots, preparing and finishing seedbeds. 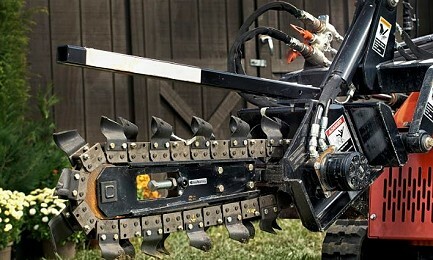 Features replaceable scarifying teeth. 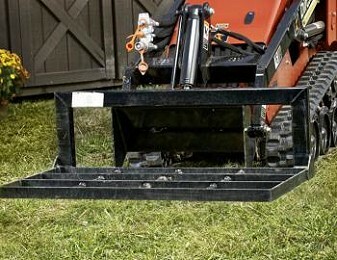 Used for rip soil, grass and other ground cover, lifting and carrying material and for pulling ball-hitch trailers. Used to compact soil, sand or gravel with up to 2,495kgs vertical compaction force. Special front lip enables back dragging and levelling. 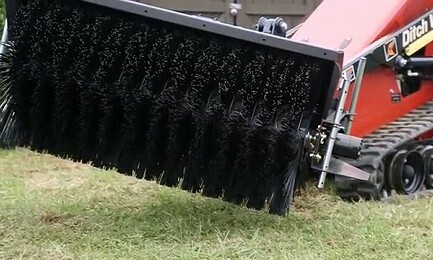 Used for sweeping debris and snow from pavements, car parks and other concrete surfaces. 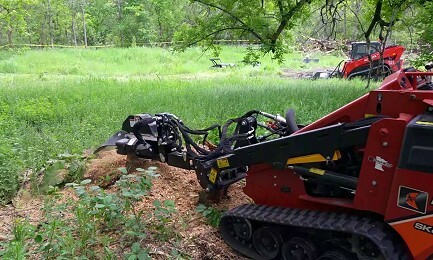 Used to grind stumps, hydraulic sweep control features a tough double-acting cylinder that allows the operator to tackle the largest stumps, without having to re-position the loader. 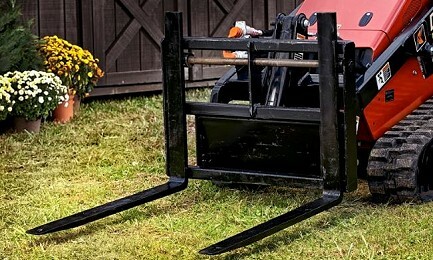 The Wood Chipper attachment can chip tree stems, twigs and branches and utilised as surface material for tracks, composted or to cover garden beds or only to decompose to ground. In spite of its small size and weight it is an efficient tool for many applications. 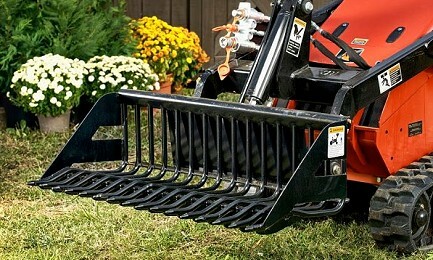 Heavy-Duty tree shovel for digging and transplanting small trees and shrubs. 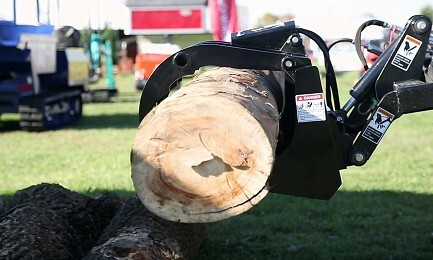 Compact and powerful design makes short work of clearing unwanted trees. 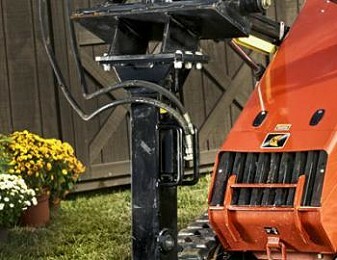 Used to lift, carry and lower rocks and balled container grown trees and shrubs. 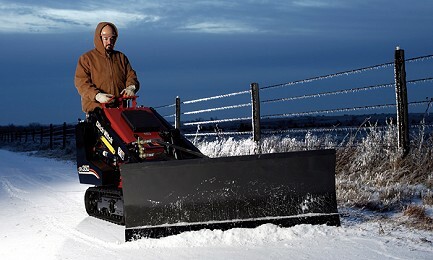 Snow Blower attachment is the perfect way to remove snow from walks, driveways or parking lots. 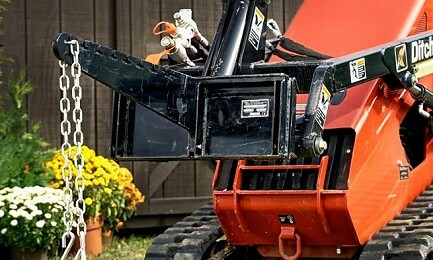 This auger attachment works great on the entire line of Ditch Witch® Mini Skid Steers—the SK 350, SK 750, SK752, SK755, SK850 and SK850 Footings machine. 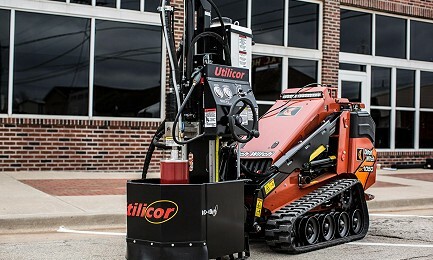 The Utilicor MTC100 attachment offers contractors a quicker, more cost-effective solution to utility maintenance and potholing一keyhole coring. 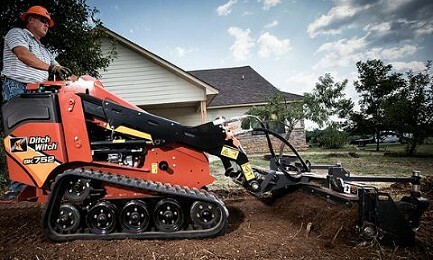 Used with a Ditch Witch SK800, SK1050 or SK1550, this powerful attachment makes accurate cuts down to 0.5 metres deep and makes up to an 455mm diameter hole. It’s less disruptive than traditional excavation and potholing methods, making it cheaper to use and less demanding on the user.